Also cooking up this month (as well as some amazing things in the kitchen, but that would be a whole other blog that I simply don’t have time for…) has been a new project with the amazing H.Ren. 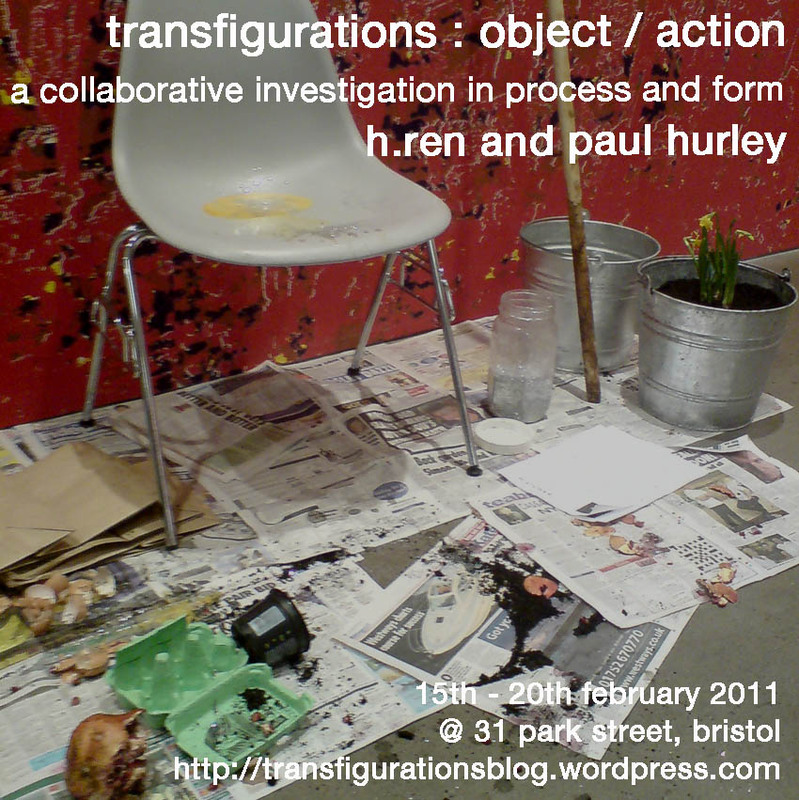 H.Ren and I have worked together on Aeon and Spotlight, but for this new project, Transfigurations : Subject / Object, we’re taking over an empty space in Central Bristol (with the help of Ruth Essex and the Capacity Project), which we’ll be transforming into an open studio / installaction space for a week (15th-10th February). This is really exciting for me, having been working in an increasingly visual way with materials and transformation in performance, as Ren shares an interest in performance, but from a background much more in sculpture. The opportunity arose fairly suddenly, so we just took it, and are looking forward to seeing what comes up out of working openly and collaboratively for that period. We’ve been talking a fair bit about Modernism, about the 1960s and what we’ve lost from it, about if / how we can make art that works, and about if / how we can be serious about what we’re doing without sounding like twats. It’s been great having these conversations with H.Ren, returning to art history in a much wider sense and looking to ideas and concepts directly concerned with aesthetics and the artist. I wonder now, if this is something I miss within live art – its development as a successful sector that values itself by its contemporary relevance (cultural, political, social, etc.) somehow overlooks its historical locatedness and its relation to qualities that I might dare to name transcendent. Hmmm. Any thoughts? We see Transfigurations as an investigation, an experiment in which we want to work responsively to each other, to each others’ disciplines, and to our context. Working without funding, we want to make the project matter, to do as much as possible on as little as possible. We’re hoping to document and blog our process throughout the week, and are looking for people to help us do so. We’ve set up a special blog for the project, which at present is pretty empty, but which’ll fill up once we get started and hopefully be quite an active discursive space, and a window into the project. If you think you’d like to help us, to either document the project or to assist in other ways, then do look at the info on the Transfigurations blog and get in touch via the contact form there. More publicity info re. the project will be released soon.